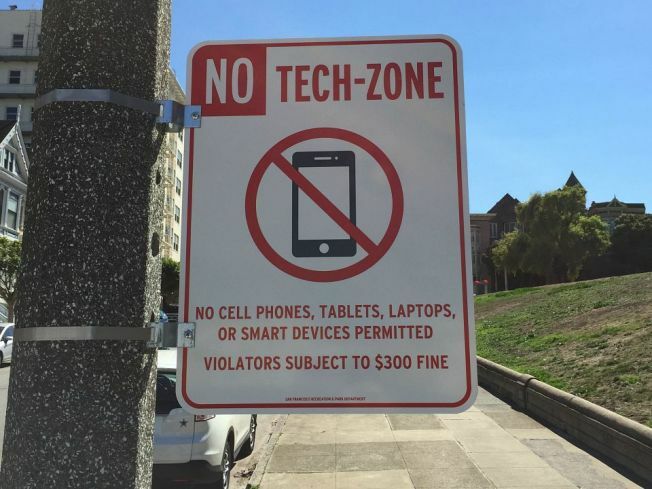 The San Francisco social media scene is buzzing with reports of a mysterious "No Tech-Zone" sign that appeared near Alamo Square. According to Hoodline, multiple signs appeared in the area — made famous by the "Painted Ladies" — stating that it is a "No Tech Zone." "No cell phones, tablets, laptops or smart devices are permitted," the sign says in big red official-looking letters, adding that violators will be subject to a $300 fine. Even though the sign has the San Francisco Recreation and Parks Depatment name on it, city officials say it was not posted by them. Nobody knows who put up the sign below the Area Q Permit Parking signs. But SFist reported Tuesday that the signs have already been removed: "SFist can report that as of Monday night or early Tuesday morning the sign had already been removed ... Nice work, internet! It was fun for the two minutes it lasted." The blog added: "This is another seeming example of anti-tech sentiment around town, though this one doesn't attack tech workers so much as it's targeting everyone with a healthy cell phone addiction, which is pretty much everyone under a certain age. "And is this really moving the conversation forward, people? No, but everyone enjoys a nicely executed joke with political/cultural overtones."